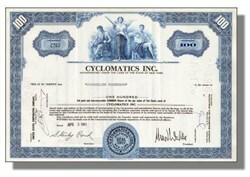 Beautifully engraved certificate from the Cyclomatics, Inc. issued in 1961-1962. This historic document was printed by the Security-Columbian Banknote Company and has an ornate border around it with a vignette of an allegoric woman standing, with her arm in the air, between two allegoric men. This item has has the printed signatures of the company's president and secretary and is over 38 years old. Cyclomatic complexity is the most widely used member of a class of static software metrics. Cyclomatic complexity may be considered a broad measure of soundness and confidence for a program. Introduced by Thomas McCabe, it measures the number of linearly-independent paths through a program module. This measure provides a single ordinal number that can be compared to the complexity of other programs. Cyclomatic complexity is often referred to simply as program complexity, or as McCabe's complexity. It is often used in concert with other software metrics. As one of the more widely-accepted software metrics, it is intended to be independent of language and language format [McCabe 94]. Cyclomatic complexity has also been extended to encompass the design and structural complexity of a system [McCabe 89]. To actually count these elements requires establishing a counting convention (tools to count cyclomatic complexity contain these conventions). The complexity number is generally considered to provide a stronger measure of a program's structural complexity than is provided by counting lines of code. Figure 6 is a connected graph of a simple program with a cyclomatic complexity of seven. Nodes are the numbered locations, which correspond to logic branch points; edges are the lines between the nodes. A large number of programs have been measured, and ranges of complexity have been established that help the software engineer determine a program's inherent risk and stability. The resulting calibrated measure can be used in development, maintenance, and reengineering situations to develop estimates of risk, cost, or program stability. Studies show a correlation between a program's cyclomatic complexity and its error frequency. A low cyclomatic complexity contributes to a program's understandability and indicates it is amenable to modification at lower risk than a more complex program. A module's cyclomatic complexity is also a strong indicator of its testability (see Test planning under Usage Considerations). Code development risk analysis. While code is under development, it can be measured for complexity to assess inherent risk or risk buildup. Change risk analysis in maintenance. Code complexity tends to increase as it is maintained over time. By measuring the complexity before and after a proposed change, this buildup can be monitored and used to help decide how to minimize the risk of the change. Test Planning. Mathematical analysis has shown that cyclomatic complexity gives the exact number of tests needed to test every decision point in a program for each outcome. Thus, the analysis can be used for test planning. An excessively complex module will require a prohibitive number of test steps; that number can be reduced to a practical size by breaking the module into smaller, less-complex sub-modules. Reengineering. Cyclomatic complexity analysis provides knowledge of the structure of the operational code of a system. The risk involved in reengineering a piece of code is related to its complexity. Therefore, cost and risk analysis can benefit from proper application of such an analysis. Cyclomatic complexity can be calculated manually for small program suites, but automated tools are preferable for most operational environments. For automated graphing and complexity calculation, the technology is language-sensitive; there must be a front-end source parser for each language, with variants for dialectic differences. Cyclomatic complexity is usually only moderately sensitive to program change. Other measures (see Complementary Technologies) may be very sensitive. It is common to use several metrics together, either as checks against each other or as part of a calculation set (see Maintainability Index Technique for Measuring Program Maintainability). 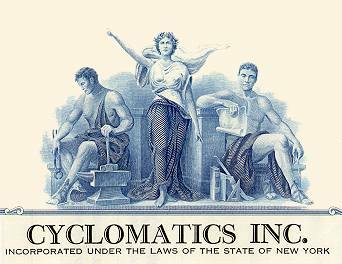 Maturity Cyclomatic complexity measurement, an established but evolving technology, was introduced in 1976. Since that time it has been applied to tens of millions of lines of code in both Department of Defense (DoD) and commercial applications. The resulting base of empirical knowledge has allowed software developers to calibrate measurements of their own software and arrive at some understanding of its complexity. Code graphing and complexity calculation tools are available as part (or as options) of several commercial software environments. Costs and Limitations Cyclomatic complexity measurement tools are typically bundled inside commercially-available CASE toolsets. It is usually one of several metrics offered. Application of complexity measurements requires a small amount of training. The fact that a code module has high cyclomatic complexity does not, by itself, mean that it represents excess risk, or that it can or should be redesigned to make it simpler; more must be known about the specific application. Alternatives Cyclomatic complexity is one measure of structural complexity. Other metrics bring out other facets of complexity, including both structural and computational complexity, as shown in Table 5. Marciniak offers a more complete description of complexity measures and the complexity factors they measure [Marciniak 94]. Essential complexity. This measures how much unstructured logic exists in a module (e.g., a loop with an exiting GOTO statement). The program in Figure 6 has no such unstructured logic, so its essential complexity value is one. Design complexity. This measures interaction between decision logic and subroutine or function calls. The program in Figure 6 has a design complexity value of 4, which is well within the range of desirability. Data complexity. This measures interaction between data references and decision logic. Other metrics that are "related" to Cyclomatic complexity in general intent are also available in some CASE toolsets. The metrics listed in Alternatives are also complementary; each metric highlights a different facet of the source code.